I was at the Ocean recently (the Atlantic, to be specific). Listening to the waves is universally wonderful. 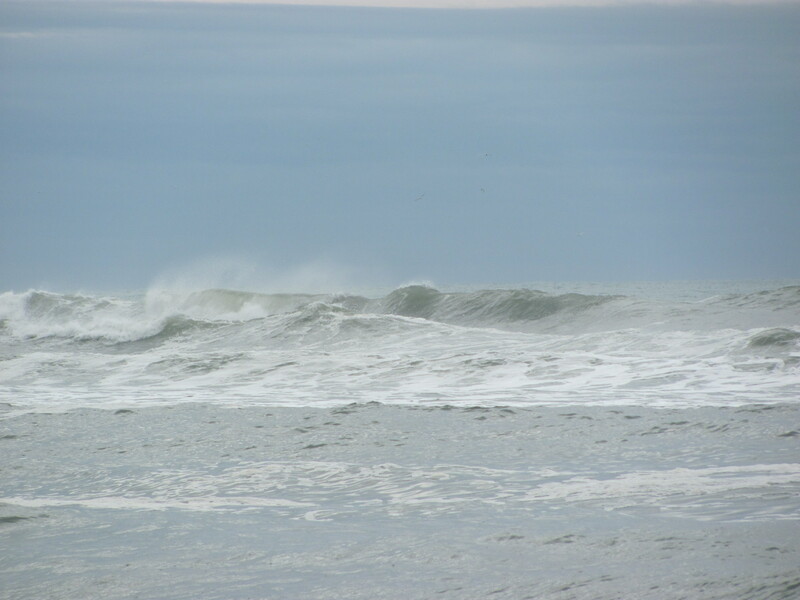 While at the beach, I spent every possible moment within earshot of the waves. I rose early and bundled on a deck chair at dawn. All day, I kept opening the door to hear to the enchanting crash. At the earliest moment, I took a walk on the beach, toes in squishy sand and frothy sea. Although the air and water were cold, I couldn’t resist the temptation; I waded in waist-deep and let the water pull me forth and back, the waves undulating, pressing me across the floor like an expert dancer. The ocean can move whatsoever it chooses: the shells, the algae, the fish, and the land. The oceanic rhythm compels us all. Natural things dominate the beach; humans are merely visitors. I encountered the familiar sea birds. 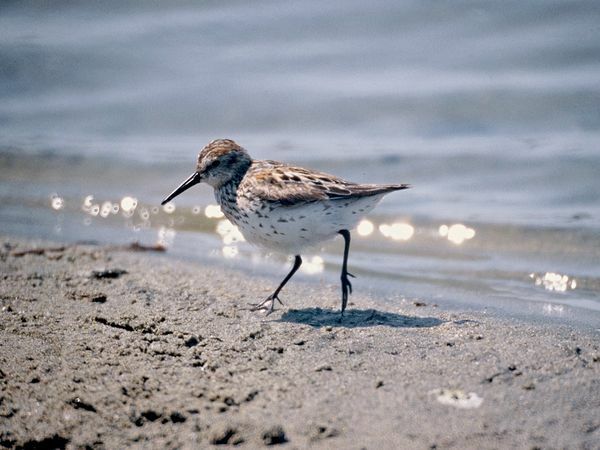 I said, “Hello, birdie,” as I watched a sand piper walk briskly in and out of the waves. Greeting animals is not an unusual practice for me. I speak to animals when I feel the urge to do so, usually when we are alone together, the animals and I. Like Coleridge’s Ancient Mariner, I “bless them” nearly unaware. Birds must have their own words to name and describe humans: heavy, lumbering, wingless creatures that we are. Are we the giants who populate their myths? I imagine scholarly birds studying the strange and wonderful migratory patterns of humans, deeming our movements bizarre and unfathomable. Could it be that our shrieks of delight, our playful entreaties, our amorous murmurs, are, to avian ears, as delightfully lovely as birdsong? Moments after the explosions in Boston, the rumors and fear-mongering began. It took law enforcement a couple days to identify the culprits, but the media immediately clamped onto any whisper they heard that held promise. Not revealing its source, the New York Post reported hours after the bombs went off that a young Saudi man was being held in custody. Internet sites picked this up, and major outlets, most notably Fox News, ran with the story. Though the story was disavowed by authorities, the media erroneously reported it because it fit a paradigm of Islamic extremism that many within the country hold as gospel truth. The New York Post is known for sensationalism; the truth will often take a backseat to a juicy headline. But with this ‘breaking news’, the Post opened a Pandora’s Box. Political talking heads were thrown their red-meat, and they let an inevitable spew of conjecture and invective fly. 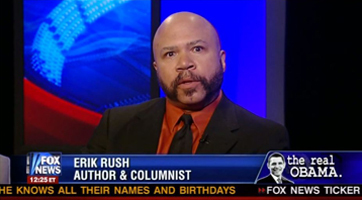 Erik Rush, a Fox News contributor, political pundit, internet personality and sometime author quickly took to Twitter, throwing gasoline unto the fire. After the Post reported about the Saudi man, Rush ‘tweeted’, Everybody do the National Security Ankle Grab! Let’s bring more Saudis in without screening them! C’mon! In response, one young man complained, You are already blaming Muslims? Rush tweeted back, Yes, they’re evil. Let’s kill them all. – Rush has claimed that gay rights will lead to governmental tyranny. – Rush suspects President Obama will classify Christians as mentally ill, and ship them off to asylums. – Rush hints that President Obama is a sign of the coming Apocalypse. Mr. Rush doesn’t shy away from radical invective, including a serious distrust of Muslims. It is no wonder that his ‘sarcasm’ was missed. But, Rush’s invective, and excuse of sarcasm is a microcosm of a much larger issue facing today’s culture. Though offensive, disturbing, or violent language is thoroughly frowned upon, it is increasingly justified or rationalized by what I am terming the ‘ISI’ stance: Ignorance, Sarcasm, Irony. Rush’s defense of his statement as sarcasm is by no means the only instance of the ‘ISI’ excuse being used recently, with varying degrees of success. A month ago, Geogios Katidos, a 20 year old Greek soccer player, celebrated a goal by giving the ‘Hitler Salute’ to the crowd. In a sport where racism and fascism are often simmering under the surface, Katidos was banned for life from playing for his national team. Katidos’ explanation for why he gave this horrendous sign? He was ignorant. He supposedly had no idea what the salute meant (which raises the question of why he was doing it in the first place). In America, Katidos’ story was overshadowed by a different controversy, but one also intertwined to the ISI method. 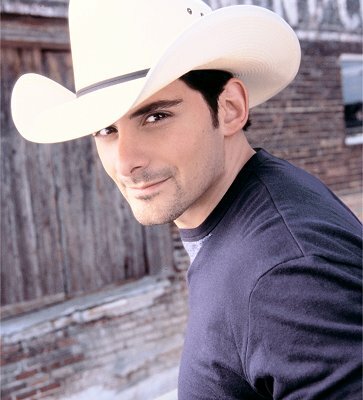 Country singing star Brad Paisley’s song ‘Accidental Racist’ made ripples in the blogosphere a couple weeks ago for its depiction of race relations, and Southern American history. In the first lines of the song, Paisley informs his listeners that his Confederate flag t-shirt does not mean he is a racist; only a Lynyrd Skynyrd fan. Paisley’s song is about irony; the irony that others see the flag on his shirt as a sign of hatred, when he intends for it only as symbol of his bad music taste. He is innocent. Paisley, Rush and Katidos share the same important benefit from the ISI defense that makes it so useful for public figures: It converts them into innocent victims. In the case of Mr. Rush, this is wonderfully ironic, since he hates our culture’s “Cult of Victimization.” Oh sure, he made a malicious and violent statement filled with hate, but he is not to blame; those who misunderstood him are to blame. Rush has been misconstrued by a mean, bad world of those who hope to destroy him. Thus, Mr. Rush’s sad excuse for an apology deflected any personal blame onto the ‘idiots’ who did not recognize his rhetorical gifts. It is our fault we took him serious about murder, not his for saying it. Hopefully, Mr. Rush will disappear from the public scene after this media din. But unfortunately, I fear his ‘Ignorance, Sarcasm, Irony’ has no bounds. Several years ago my (now ex) husband, Steve, and I had talked about getting a dog. We were childless professionals who had moved to the suburbs and became first time homeowners. I felt that we were between plant and pet in the evolution of plant-pet-child (the logical progression of family/personal responsibility). We took many years to master the plant stage and really felt ready for the pet stage. I didn’t grow up with a dog, my dad actually got one just before I moved out. Steve had more experience in his childhood with many good, family memories. So, we considered how we’d move forward in this progression of the family life we were building together. We read, researched and were drawn to so many different breeds. At one point I was fascinated with pugs. He has asthma and I had vision problems (since corrected by surgery). 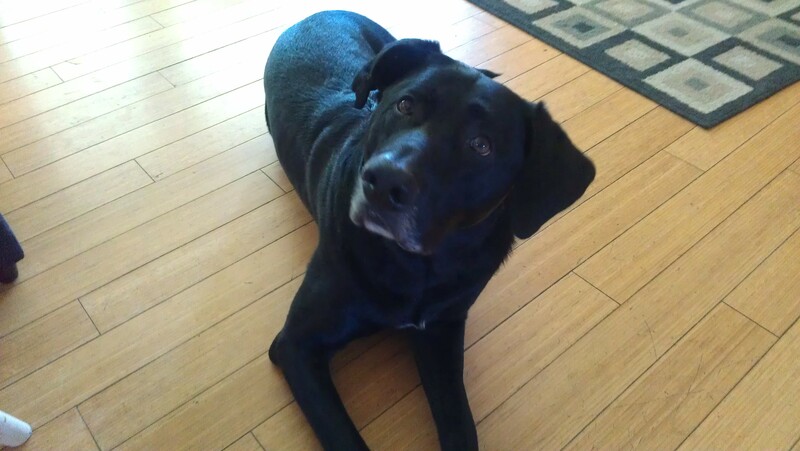 We thought that having a dog with a microcosm of our own health issues was too close to home. We alphabetically reviewed all breeds described by the American Kennel Club (AKC) and talked constantly about dogs with whoever would listen or have information to share. After eight months we decided to not get a dog. We were right where we started but by now were practically experts on dog breeds, their potential health issues, common behaviors, needs, size…. everything. Through the course of an evening of playing with kids, holding puppies and enjoying food and drinks Steve brought up the now-long closed conversation about getting a dog. I knew that we weren’t going to get a dog but it was fun to hold and play with a litter of 8-week old puppies. These were beautiful dogs, almost entirely black (they looked like black labs). Every time I went into the “puppy area” there was one dog who sought me out. In fact, looking back there was only one puppy of the litter that I held and played with. I visited this puppy area with and without my nieces throughout the night, stopping up at the bar to replenish my Guinness. I recall the seeming interest the one puppy had with my Guinness and I joked that he had good taste, seeking out me and also my Guinness! I asked what breed the dogs were and was told “German Shepard” to which I had a snarky response of, “Do you even know what a German Shepard looks like? The reply, “Maybe German Shorthaired Pointer?” I concluded they are likely black labs. There was also the “runt” of the litter who was, as you can imagine, super-cute and endearing to many of the kid’s hearts. At the end of the evening it was time to finalize silent auction bidding. By this time we were ready, after eight months of data collection and multiple puppy-to-puppy visits through the evening, to make a move expanding our family through a canine addition. Steve is probably the best strategic game-player I’ve ever met. He has the uncanny ability to see many moves ahead, anticipate other’s moves and change (or stay the course) accordingly. So, when he suggested a way to bid and how to bid we followed it. This meant we got the first choice; five bidders for five puppies. Steve wanted me to hold the runt of the litter to see if that was “the one”. At the moment he placed the runt in my arms three simultaneous events occurred: 1) a young girl had a look of disappointment and exasperation (she wanted the runt! ), 2) the runt jumped out of my arms and wanted nothing to do with me, and 3) the puppy who sought out the Guinness and my company through the evening looked betrayed at my holding the runt. We picked the puppy who sought out my Guinness and my company; the only puppy I had interacted with through the evening. I know he chose me. We named him Duke in honor of one of Steve’s favored dogs growing up, Duchess. Duke became and continues to be my first canine love. He opened up the world of canines and led me to being an avid supporter of humane education and animal welfare. Duke is turning 8 in May and I love him more than I thought ever possible – he is my first canine love. Oh, and it turns out from a DNA test (saliva sample) that Duke is 50% German Shepard, 25% German Shorthaired Pointer and 25% Wire-Haired Pointing Griffon. Snarkiness in check. This past Friday, I attended a “Volunteer Appreciation Dinner” at my dad’s VFW post for everyone who had accrued a certain number of hours of volunteer service. Every Monday night, my dad and I help clean and rearrange the hall after their weekly Bingo. It’s not life-saving work, but it’s a helping hand. It was a nice event with about 75-100 people, and at the end of the evening, there was a raffle. The prizes weren’t extravagant – restaurant gift cards, bottles of wine and alcohol – but nonetheless, the raffle was nice touch. As the Post Commander announced the winning tickets, I thought about my raffle-related regret from a couple years ago. 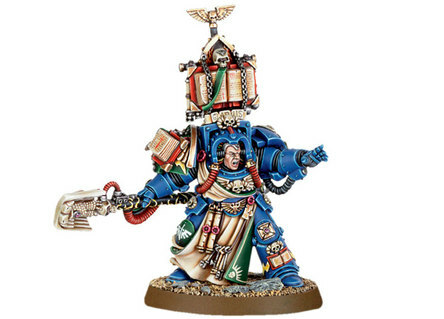 My older brother is into tabletop gaming, specifically Warhammer and Warhammer 40k. If you’re not familiar, basically they are extraordinarily complicated board games. The rules aren’t just a sheet of paper like in Scattergories or Scrabble; the main rulebook is the size of a college textbook, and there are additional books that add depth to the rules. And the rules are constantly evolving, which makes it a task to keep up with. There is also the hobby side to the game, which requires players to purchase, paint, and customize their own game pieces and game boards. There are events and tournaments of all sizes where gamers go to play against one another. A few summers ago, my brother organized an event in the town hall near his home. About 50 people attended the event, which included a full tournament, a ton of food, gaming items to purchase, and a raffle with proceeds going to a local animal shelter. Since it was a fairly sizable event, he asked me to help out. When I was in mid-teens, I played these games with my brother. They are fun, but they’re also expensive and time-consuming. And I was terrible at – and thus didn’t enjoy – the hobby side of it. I can’t paint a bathroom wall in my house without messing up, let alone an intricate miniature the size of my thumb. So, after more than a decade of not playing the game, all I was really qualified (and required) to do at my brother’s event was to serve food and sell raffle tickets. Despite sometimes being labeled as geeks, the majority of gamers are just regular people with a hobby they enjoy. Their lives aren’t consumed with the game and they don’t all live in Mom’s basement. Like my brother, a good number of the people at the event were married guys with children and they partake in the hobby during the little spare time they have between work and family. One guy had his son with him, a cute little boy of about 10 with a mop of red hair hanging over his forehead. The little boy was also playing in the tournament, and he was so excited to be playing with the “big kids” that he couldn’t stop smiling. Halfway through the day, he and his dad came over to look at what raffle prizes were available; there were an assortment of gaming prizes, ranging in value from probably $8-$100. The little boy looked over everything excitedly and then asked if he could please have some raffle tickets. His dad bought him a few and I tossed the tickets into the big, clear container with the rest. After the tournament, my brother held the raffle. I pulled the tickets and he announced the winners and distributed the many prizes. During the process, the little boy stood next to his dad with his tickets clutched in his hand. After every number, the boy desperately checked his tickets. As the prize table started to empty, the boy got antsier and his eyes drooped in despair. I kept hoping I would hand over one of his tickets. A lot of people won a prize. A few people won multiple prizes thanks to buying lots of tickets. That wasn’t a “bad” thing, necessarily; after all, most of those people bought a lot of tickets not just for the prizes, but because they wanted to support the animal shelter the money was going to. And then there was the little boy: his tickets never got called. He sat down in defeat. I felt completely guilty as the person pulling the tickets. For everyone else in the room, these prizes were more of a discount than a victory – they all could buy this stuff for themselves right after the event if they wanted to. For that little boy, it would have made his entire day to win something. Like all little kids, I’m sure he got over it quickly, but I was still hurt on his behalf, especially when it dawned on me immediately after the raffle ended that I had the power to cheat. With a little legerdemain, I could have pocketed one of the kid’s tickets and passed it off as a drawn ticket whenever I wanted to, without my brother or anyone else knowing. I would have cheated someone else out of a prize, but it would have been worth it to make that little boy’s day. Sure, it can be argued that kids have to learn they can’t always win, and that it was right of me to maintain the integrity of the raffle. But, 1) Every kid will endure enough losing in his/her life as they grow up; I don’t have to pile on, and 2) It was an raffle for gaming supplies, not the lottery. Duh. I guess that would have worked, too, huh? At the VFW, my dad and I both won gift certificates in the raffle. When my dad won, he yelled and waved his winning ticket over his head as a joke and to make a spectacle of himself, because that’s his style, not because the prize excited him that much. We both can afford a $20 meal, so the prizes were more of a discount than a victory. When I won, I merely said thank you. I don’t get excited easily, which sometimes works to my advantage, but at other times I’m envious of people who can be cheerful and excited about the little things in life. And, being that as it is, I was disappointed that I didn’t cheat to bring some joy and excitement to a kid’s life. By Mick McMahon, English Faculty. How do you feel right now? Comfortable, I hope. How did you get this way? Did you have a long productive day at work and now have the chance to unwind? Did you spend a number of hours researching and drafting a paper for school and just handed in the work confident you will earn an A? Did you just run a marathon and now icing down while reading this Turtle post? Whatever the task completed, large or small, congratulations! You just completed something important and, even though you may feel exhausted, you most likely feel quite good about yourself. Now, I’d like you to think about how you felt before undertaking that task. Did you stress? Were you a bit fearful of the unknown? Or did you charge in, head first, with reckless abandon, knowing that whatever the outcome, you did your best? Maybe this sounds familiar. Often times, I stress about things that I have little control over: getting caught in the rain, having a heart-attack out of the blue while exercising, the apocalypse (thanks a lot Hollywood). I generate unwarranted anxiety that leads to inaction and excuses, and end up stalling and stressing instead of acting. And folks, I’m not the only one. We’ve all made up a few excuses at one time or another. Sometimes, we end up focusing a tremendous amount of energy on stressing about the task, instead of channeling that energy into the actual task itself. So what creates anxiety? It can be several things, but the one characteristic that stands out to me is the unknown. Think about your first day of high school or college. Maybe you felt a bit nervous, because you didn’t know what to expect. Compare that feeling to how you felt during your senior year of high school or college. Even though you were exhausted, you probably felt a lot more comfortable because you went through experiences. It’s how we traverse the unknown that helps us learn about ourselves, and what we find out, whether good or bad, makes us unique and wonderful individuals. What you now read before you was weeks, nay, several months in the making. 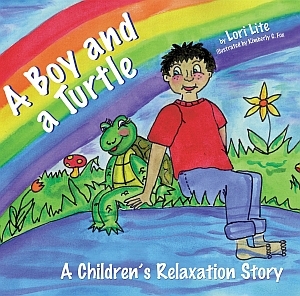 Ask my colleagues sometime about the excuses that I came up with as to why I haven’t written Turtle posts. Most likely they all lead up to me having to walk my dog. The plain truth is that I was anxious about sending out the perfect bit of writing into the universe. So, I lay my discomfort before you now. Will you say, what on earth is he talking about? Is he crazy? Perhaps, but I will learn about myself and my writing by sending this post out to the world. So, while comfortable is good, uncomfortable can be even better, for it helps us learn the truth about ourselves, and makes the beer taste so much better. Science Fiction or Future Predictions? Growing up you could throw out my Barbie dolls for space ships and aliens any day. From the Han Solo decal on my bathroom door to the Keep Calm and Allons-y poster in my bedroom I think it is pretty apparent I am an avid science fiction fan. Star Wars, Doctor Who, Fahrenheit 451, 1984, and A Brave New World are some of my favorite amazing tales of adventures through outer space or dystopian futures, but after watching one of my favorite Doctor Who episodes titled “Blink” I started thinking about science fiction and the number of astounding predictions in books that came true. In the episode “Blink” we are introduced to a terrifying new villain, the Weeping Angels. The Weeping Angels are aliens who appear to be statues that cannot move when you look at them. When you look away though, they are quick and if they touch you they will zap you back in time. So, my theory is that famous science fiction authors are great at writing about futuristic technology and events because they were actually sent back in time by the Weeping Angels. Alright, I know that isn’t possible, and my inner Whovian is showing by even considering that the Weeping Angels exist, but this did get me thinking about all these wildly outlandish predictions in science fiction that ended up becoming reality. 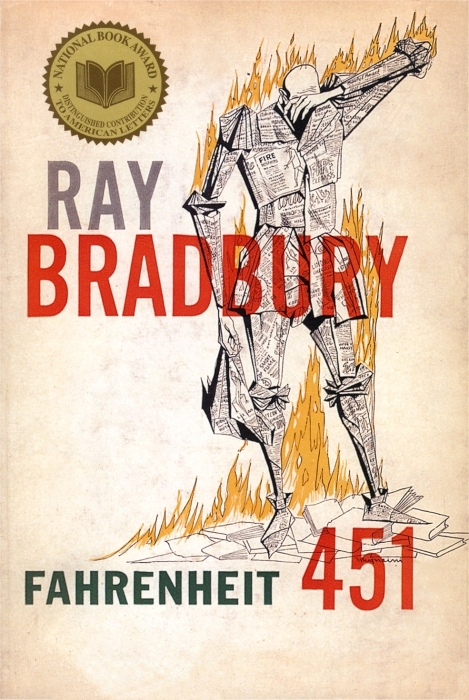 In 1950, Ray Bradbury wrote one of my favorite science fiction novels of all time, Fahrenheit 451. In the book Bradbury writes, “And in her ears the little seashells, the thimble radios tamped tight, and an electronic ocean of sound, of music and talk and music and talk coming in, coming in on the shore of her unsleeping mind.” To me it sounds like Bradbury is describing earbud headphones, which did not become popular until 2001 when they were released with the first-generation iPod. In addition to earbuds, Bradbury writes about the obsession that people have with their “parlor walls.” The walls were described like giant interactive flat screen televisions, not too far off from today’s technology. It is also said that people could talk with friends or family through the digital wall and today we write on each other’s walls on Facebook. Ray Bradbury actually warns in his short story “The Pedestrian” about the loneliness that can come from constantly paying attention to the millions of screens around us when protagonist Leonard Mead is actually arrested for the crimes of taking a walk and not owning a television. Maybe more people should take the hint. Bradbury was not the only visionary in the science fiction world. 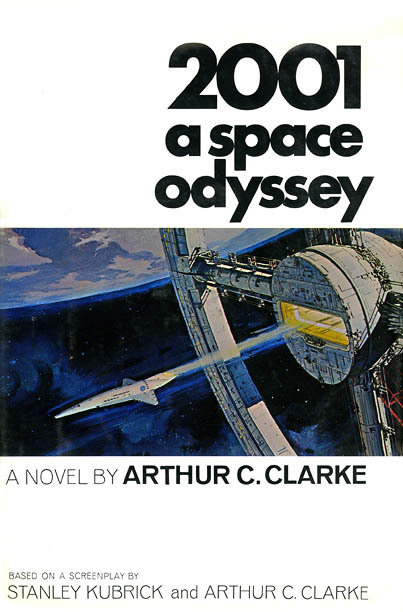 Arthur C. Clarke wrote 2001: A Space Odyssey in 1968 where he describes a “newspad” which sounds eerily similar to an iPad which was introduced on January 27, 2010. Clarke also writes about virtual reality games in his book The City and the Stars in 1956, long before the first virtual reality game. In 1909, author E.M. Forster wrote The Machine Stops were he describes hexagonal workspaces that sound an awful lot like cubicles, which did not enter offices until the 1960s. The most astonishing of all the predictions was Hugo Gernsback’s ability to describe radar in 1911, 22 years before its first use. All of these predictions are pretty amazing and it is fun to think that sci-fi writers are actually time travelers, but in reality there is something even more exciting happening here. It is more likely that sci-fi writers are paving the way for the future. Do you know how many posts on Facebook I have seen about people asking about wanting their hover skateboard from Back to the Future Part II? A lot! It turns out that the imagination of sci-fi writers creates technologies and images that readers want. Sci-fi authors are among the most important writers, because their dreams, their warnings, and their amazing stories push society to make them a reality. 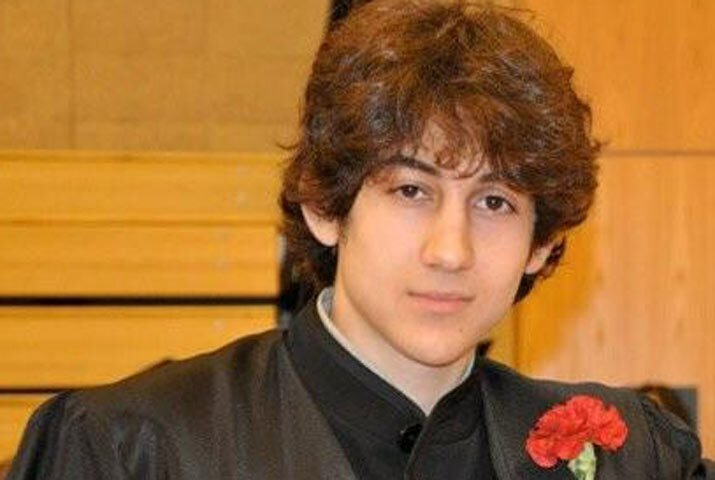 From ‘Good Kid’ to Terrorist (Some Thoughts on Boston). Tags: Dzhokhar Tsarnaev, History Faculty, Michael Stelzer Jocks, Scott Atran, Terrorism. Well, that’s over. As I write this, I am watching NBC News coverage of the capture of “Suspect 2” in the Boston Marathon bombing, Dzhokhar Tsarnaev. This has been one of those events when you feel like history is being made, so I want to write a couple blogs in the coming weeks in response. This blog is the first of those. One of the disturbingly enthralling aspects of today’s media coverage has been the interviews and reactions of those that knew “suspect #2” before his apparent conversion to violence. Over and over today, I have heard 19 and 20 year kids, high school teachers, and parents of friends describe Dzhokhar Tsarnaev as a extremely normal kid. Most interviewees have been calling him quiet, athletic, friendly, helpful and kind. The shock of those who knew him is telling. No one foresaw this. It seems the older Tsarnaev was more militant. Reports have depicted him as a loner; as ideological. But, his younger brother doesn’t seem to fit that mold. Now, this may be completely wrong. Perhaps law enforcement will find loads of documents, and writings that prove that the younger Tsarnaev was the ring leader in this attack. I can’t say, though it seems unlikely at this point. We are left asking then, why would this seemingly normal kid commit this horrendous act? If the younger Tsarnaev had been killed tonight, such simplistic bombast and platitudes would most likely control all discourse. With him in custody, perhaps we can find out the truth of his motivations, and as the anthropologist Scott Atran has found, the motivations of terrorists can be surprisingly recognizable. 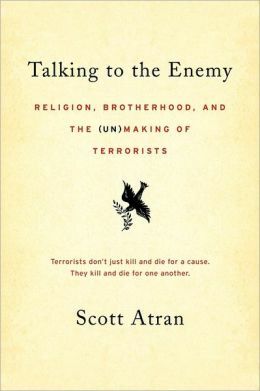 An incredibly brave scholar, Atran has spent the last decade interviewing members of terrorists groups, their families and their friends, compiling his conclusions in his 2008 book, Talking to the Enemy: Religion, Brotherhood, and the (Un)Making of Terrorists. His interviews of young terrorists most often found that they “were campmates, school buddies, soccer pals, and the like, who became die hard bands of brothers in a tragic and misbegotten quest to save their imagined tribal community from…morally deformed” enemies. These youths join cells and organizations because they are intrigued by “the camaraderie of a cause, however admirable or abhorrent, and the courage and commitment that come from belonging to something larger.” In other words, it is not necessarily ideology that makes these young men kill. They kill for their community. They kill to protect and strengthen their biological or social family. Is this what happened here? Is this how a ‘nice, kind kid’ became a murderer? Maybe. Maybe not. We should know soon enough. My one hope is that people pay attention to this young man’s motives, and don’t simply label him an Islamo-fascist, or a nut-job, or a bad-guy. Doing so only simplifies, and thus clouds, a complex phenomenon. If you’re any kind of sports fan, and especially if you’re a Chicago sports fan, and most especially if you’re a Bulls fan, you’ve probably spent a minimum of 30 minutes reading a few sports columns, and/or listening to the tube, and wondering what could be going on with Mr. Derrick Rose–meaning, why isn’t he playing basketball? After all, that’s his job; that’s what he’s paid to do; that’s what he’s good at–more than good, that’s what he does better than anyone else in the greater Chicago area, does better than almost any other human being living anywhere on this great green globe. 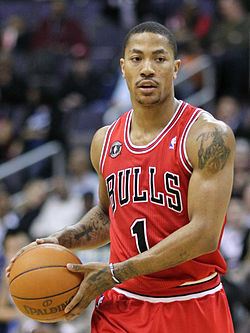 Indeed if, as Aristotle maintained, human beings should do what they do best, surely D. Rose should be playing basketball. What explains why he isn’t? Of course one answer might be that he’s still recovering from last year’s knee injury. This makes some sense save for the following: he’s been working out religiously for several months; his doctors have officially stated he’s ready to play; and finally, he regularly reminds reporters of the enormous progress he’s made since his surgery subtly suggesting he might return any day. But, almost in the same breath, he suddenly backtracks and insists he’s not quite ready to rejoin his team mates. Rose’s fans have clearly become frustrated with him, twittering how they feel he’s gone soft, become rich and lost his love of the game. Rose denies the charges, yet reiterates how he won’t be swayed by fans pressing him to return before he feels ready. Oddly enough, Iman Shumpert, who plays for the Knicks, suffered the same injury on the same day Rose did; however, unlike Rose, Shumpert returned to the Knicks several weeks ago, and says his play hasn’t been hampered in any way by the injury. Frankly, for the last month or so, I confess media’s coverage of Rose baffled me. Were they hyping the return issue simply to sell a few extra papers? Obviously, Rose would be back in time for the playoffs. Clearly I was wrong. My view now is that Rose will no more lead the Bulls’ playoff efforts than I’ll go bungee jumping off the Cubs new electronic scoreboard on Christmas eve. When I realized my mistake, I went back to the drawing board, looking for a new explanation of Rose’s behavior. Happily, after much brain storming, and lots of discussions with my sports savvy brain trust, the real reason Rose hadn’t been playing hit me as I was emptying the dishwasher. The answer was simple, straightforward, convincing, and had the added advantage it could be stated in a single fairly well known word which enjoyed a storied history, harkening all the way back to the pristine beginnings of Western Civilization itself. That one word, dear reader, is hybris (hubris)! As most of you know, hybris is usually defined as overweening or excessive pride. Hybris explains how heroes commit horrible blunders because they dangerously overestimate their powers while understating reality’s recalcitrance. Hybris is behind Achilles’ sulking, and Oedipus’ decision to kill his father and marry his mother. 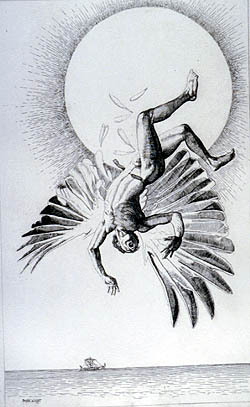 It’s also why Icarus forgets his father’s warning, and flies too close to the sun, perishing after the sun melts his wings which were made of wax. How does all this hybris stuff relate to D. Rose? Simple: like Icarus, and Achilles, Rose is suffering from a bad case of hybris! This may sound farfetched since we’re so used to thinking of Mr. Rose as a down to earth, modest, quiet, considerate, well mannered, laid back guy–an everyman, like you and me. When it rains, he stands under the open ended plexi glass bus shelter waiting for the Jeffrey Express, just like we do. A blue collar guy for a blue collar town. A week ago, I believed this; I don’t any more. Now I think it’s pure mumbo jumbo–nay, double mumbo jumbo! How in the world could I have been gulled by such nonsense? Well, Mr. Rose seemed nice enough on the tube; a host of Bulls players and coaches and coaches from other teams confirmed this account; and local and national media reports out did themselves endlessly repeating the Derrick Rose modesty story. Clearly, this guy isn’t like Kobe or Michael. But I no longer believe the hype. And the reason is that, in the cold light of day, it makes no sense. Rose is a super star and plays like one, by which I mean, he often plays as if he thinks he can almost beat the opposing team single handed. He’s so fast, and so strong, and soars so high, he can easily blow by two or three guys and still score. But trying this over and over again in the playoffs–well, that’s hybris. Ironically, in last year’s fatal playoff game, he did make it to the basket unscathed, but afterward, when he landed, he twisted his ankle and blew out his knee and hasn’t played since. Here’s a second example of hybris: after his surgery, Rose wanted to devise a rehab plan where he could have it both ways meaning, he wouldn’t disappoint his fans, yet he wouldn’t commit to playing if he didn’t feel entirely comfortable with his recovery. But he never went public with this admission which is what he should have done. Instead, he thought if he showed everyone how hard he was working, his fans wouldn’t be upset if he skipped the season. But he was wrong; again, hybris had led him astray. His fans were furious. Hybris led him astray one more time. Where before his injury he played as if he was invincible, afterward he became a head case exaggerating his fragility. His judgment had gotten out of whack, which is precisely what hybris will do to a star who flies too close to the sun. Tags: Boston, Boston Marathon, History Faculty, Kabul, Michael Stelzer Jocks, Terrorism. Like millions of Americans, I was saddened and shocked by what happened in Boston on Monday. Three people, including an 8 year old boy, were killed, and over 170 were injured in the bombing at the Boston Marathon. As we have seen so many times, American national bonds after such tragic events always seem to be strengthened. Whether Democrat or Republican, the President inevitably leads the people in mourning. Public officials reassure citizens that justice will be served. Psychologists remind us that we need to go on with our lives, and not be overtaken by fear. As with Oklahoma City, the Atlanta Olympics, and even 9-11, we will mourn, we will find justice, and we will keep living. We hope that this will not happen again in America, but, unfortunately, we assume it will. In other parts of the world, there is no assumption of a future bombing; only assurance. Two days removed from Boston, and I can’t stop thinking about the ubiquity of crude terrorism in other nations. In Syria, Israel, Iraq and Afghanistan, explosions in public places are a weekly, sometimes daily occurrence. Of course, I realized that before Boston. But, how many times have you (and I know you have, because I do it to) simply shaken your head when you hear of 50 women and children killed by a car bomb in Kabul? When such news comes across the wire, the radio, or the internet, most Americans turn the page, decrease the volume, or navigate to another site. I accuse Americans of this because I am an American, and I am guilty. Afghan, Iraqi, and Syrian children being killed by pressure cooker bombs doesn’t shock Americans any longer; but, it should. 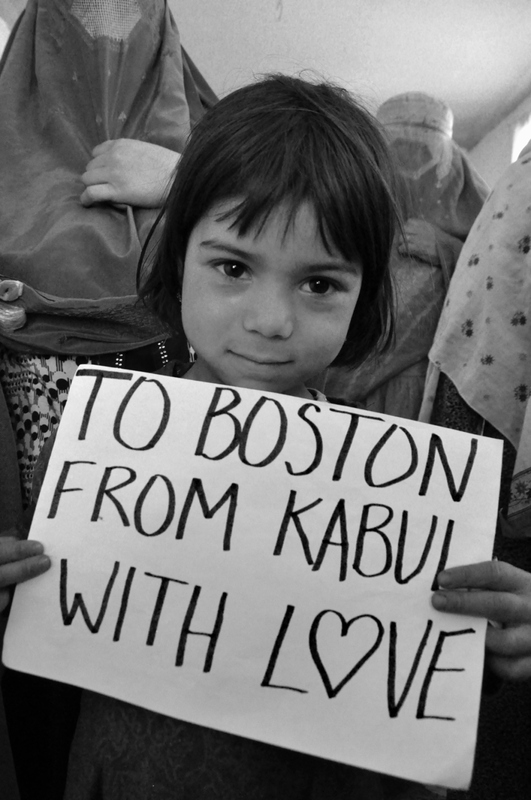 After Monday, we need to appreciate that Boston and Kabul are not that far apart.